Biodynamics is a way of farming that respects life forces. The father of biodynamics was Rudolf Steiner who gave the Agriculture course that forms the backbone of biodynamics in a series of lectures in 1924. He based his course on observation and research and interrogation of ancient methods and peasant farming. Biodynamics is garnering more attention in the wine world. Top vineyards like Domaine Romanee Conti in Burgundy and Chateau Pontet Canet in Medoc are certified organic and biodynamic. Many top restaurants now focus on biodynamic wine. At Chateau Feely we started the biodynamic road in 2007 with reading a book by Nicolas Joly and then continued to learn and grow through books and courses by Pierre Masson, a man of deep knowledge and insight into biodynamics who left this earth for the next place on 22 July 2018. Pierre Masson was a force in terms of research, education and publication, bounding with energy and excitement for life and the work that he was doing on biodynamics. He published books on biodynamics including the indispensable practical handbook ‘A Biodynamic Manual’. We are enriched for having learnt with him, for his insights on his courses and on his visit to our farm and for his stories. Our thoughts are with his family. He gave me this horn and crystal to start our biodynamic education and demonstration trail which will be dedicated to him in deep gratitude. Go well Pierre. Gratitude to Pierre Masson a biodynamic force who left his earth for the next place on 22 July 2018. 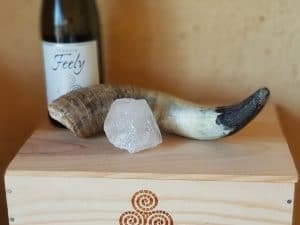 He gave us this horn and this crystal to start our biodynamic demonstration trail which will be dedicated to him. Go well Pierre. Point one is about thinking of the farm almost as a living thing. It is also about thinking of what would be viable without fossil fuel as a self-sustaining entity. For example if you are organic you can bring 100 tons of cow dung to your vineyard but that is not a self sufficient and it will create excess / imbalance in your vineyard. The dung generated by how many cows your farm would support naturally would be a better level to apply. For point two the two key preparations are the 500 cow horn compost spray and the 501 silica spray. Despite their tiny doses (a small handful per hectare for the 500 and less than a teaspoon per hectare for the 501) usually twice a year, these are powerful preparations. The third part of biodynamics, the calendar that plots the lunar, planet and constellation cycles helps us to plan our work at the ideal time. Most farmers used a calendar like this, called the farmer’s almanac, until chemical farming took over in the 1970’s. Like any farmers we follow the seasons and the weather, the biodynamic calendar is a plus, we use it to fine tune our activities. 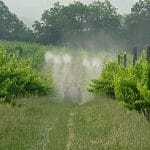 When we started applying biodynamic teas a decade ago it was a solution to downy mildew in our vineyard. In our first two years of organic conversion we used the maximum dose of copper allowed in the EU, six kilograms per hectare (kg/ha), and still had fungal disease, not bad enough to lose our crop but enough to give us sleepless nights. Now, more than a decade later, our copper dose over a five year average is a quarter of the EU maximum and we have no fungal disease. Our vines disease resistance increasing – their immunity grows with each year of natural farming – and to the biodynamic anti-fungal teas and wider practices. Biodynamics offered a practical point solution to disease but over time it has delivered more, including a better balance, a harmony to our wines. Biodynamics is essentially organic plus – to go biodynamic a farm must already be certified organic. Organic certification is legislated at the EU level so there is a minimum standard. Biodynamic certification is not yet standardised so each certification body sets its own standards – always stricter than the EU organic standard. For example the biodynamic certification body Demeter maximum copper dose (for downy mildew – a fungal disease in the vineyard) is half the EU organic level, that is 3kg/ha instead of 6kg/ha. The winemaking rules are also stricter than organic. For example the sulphite maximum for dry red the EU conventially farmed maximum is 150 milligrams per litre (mg/l), the organic is 90 (mg/l) and Demeter is 70 (mg/l). Only natural yeast from the grapes can be used – no added cultured yeast even if its certified organic. If you find this illuminating please share this article. Do you pick up taste differences between biodynamic and chemically farmed wine? I would appreciate comments/ your experiences. See our series on why organic and read more about biodynamics. Come and learn more about organic and biodynamic farming with a visit to Chateau Feely in South West France ; stay with us or do a multi day course or multi day tour . You can read about the story of our organic farm the series includes three books Grape Expectations; Saving our Skins and Glass Half Full by Caro Feely. Join our mailing list to receive our seasonal newsletter, wine school, events, wine pairing, recipes and more info on this topic at the bottom right of this page. I’ve googled the 500 cow horn compost. It seems very complex and something that must be locally sourced. Is this true or is this an urban novice could do? Thanks for your comment and question. I will do another post on the cow horn compost. It is complex as the compost needs to be from biodynamic cows and it all needs to be prepared in a special way and with particular timing. It is possible to do as an urban novice if you have a local biodynamic farm where you can source the cow dung. I recommend finding a local group and joining them to do it communally rather than trying to do it on your own. 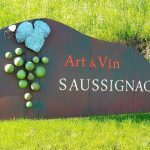 There are two in our region (1 near bergerac and 1 near st emilion) if you would like the details let me know.